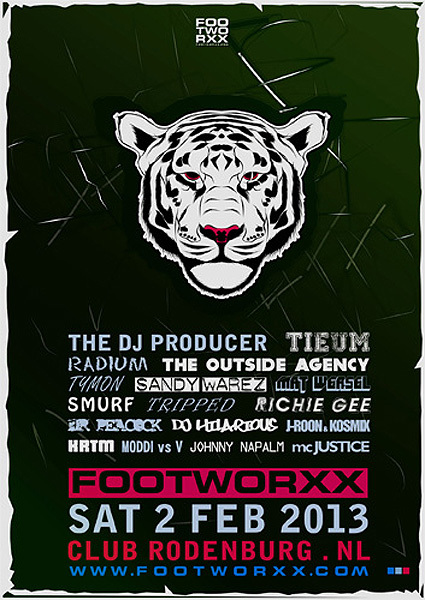 After years of organizing the hardest, fastest and most underground parties, Footworxx is going Dutch! As a tribute to their army of fans, spread wide over Holland and across the world, they will make Club Rodenburg thunder and roar. Well known for their brutal sound, but not easy to be defined: Footworxx is going to move your feet. Founded as a techno-inspired organization, Footworxx has evolved into an organization that is most loved for its diversity. Combining very different but always only the hardest kinds of electronic music has made them notorious throughout the borders.